I originally had intended for today’s column to be about the Keeling & Clayton team – as promised at the end of last week’s column – but in the days since then, I’ve been flooded with requests for more Mickey Thompson info and photos from readers, so the thread lives to fight another day. Pretty soon, we’ll be approaching ramp-truck and wedge-dragster thread length! Last Friday, I showed what I thought was a pretty cool photo of the Mickey Thompson Mustang with a Top Fuel rear wing sticking out of the roof, but famed Northwest historian “Flyin’ Phil” Elliott one-upped me with this pic, showing wings at both ends! “According to Pat Foster, this configuration was only tried in pre-race testing at Bristol, the week prior to the AHRA Spring Nationals," wrote the other Phil. "The tech officials took one look at the inability for the body to tilt up without taking the front wing off and said, ‘Nope.’ PF said the downforce caused the engine to pull way down, and each test run ended in piston smoke.” Way cool photo! Steve Ellingson scrutinized one of last week’s photos of this same car (right), and his trained eye offered up questions to which I don’t have answers, but perhaps one or more of you do. Longtime regular reader/contributor Robert Nielsen clued me into the amazing video at right, which shows this car in all of its glory. It was shot at the AHRA Spring Nationals in Bristol, and in several scenes, you can see the holes in the hood from which the wing struts protruded in the first photo of this column. “One of the opening scenes shows the car at the top end slowing down, with the parachute out and dancing all over the racetrack – really an exciting ride! There are also a couple of quick scenes with Mickey Thompson in them. I particularly like the one that is about two minutes into this video where he appears to be very upset with a couple of track officials. He stomps over to one official, who then points him in the direction of another official, where Thompson looks like he unloads some sort of verbal barrage in his direction in typical Thompson style and character. 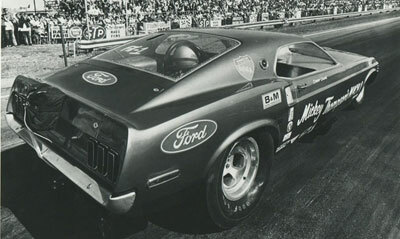 Speaking of Mickey’s Mustangs, I got a great note from Nostalgia Funny Car shoe Jeff Utterback telling me that he and Richard Stannard (Beach City Chevrolet Corvette) are building a tribute/re-creation of the blue MT/Mach 1. Not to be outdone, Dino Powell dropped me an email to say that Thompson’s final U.S. Marines Grand Am (right) is being restored. Powell acquired the car from the widow of one of the car’s many later owners and recently sold it to yet another buyer, who will restore it; he’s promised to have that gentleman contact me with details. “I am just a huge drag race fan who from time to time stumbles across a few famous old cars,” he said. 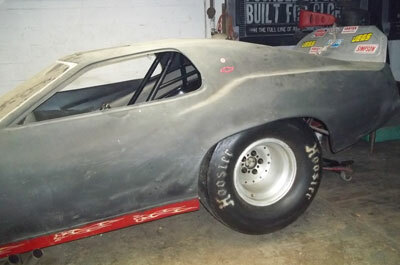 “I recently bought and sold the Don Tuttle-built Arley Langlo Zip Code dragster and am restoring it. I currently have been involved with a Pro Stock Duster and a box truck that has a story beyond belief but is the real deal.” He has promised to share that story with me, too. The great and generous Steve Reyes passed along another of his wonderful images at right, showing Thompson’s Vega at Lions, photographed – as was the norm at the time -- with a shapely model, in this case Joan Trejo, girlfriend of the car’s driver, Henry Harrison. Brenner’s request will dovetail nicely with a story I’ve been contemplating for a few weeks, since the aforementioned Nielsen vehemently challenged my assertion that Roland Leong is Hawaii’s greatest drag racing export. He not only believes that the title belongs to Ongais, but also that current nitro crew chief Todd Okuhara is ahead of Leong on this mythical list. Without launching (much) into my side of the debate right now, I do admire Ongais’ quarter-mile wheel work (though he became more famous for his driving in other forms of motorsport), but Leong is at the top of my list because of his long, long history as a car owner; the opportunity he gave to many drivers to start, improve, or prolong their careers; his long history of sponsorship work, broken records, and event wins; and his current status as one of the top nitro tuners in the nostalgia ranks. So let’s hear it from you guys out there! 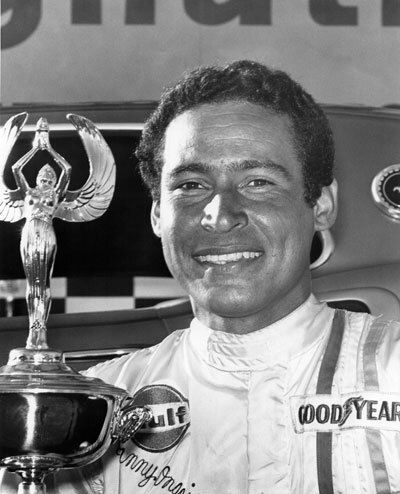 Who is Hawaii’s greatest contribution to drag racing (and only drag racing), and why? OK, that’s it for another fun week. I’m headed out to Gainesville next week but hope to have another column ready before I hit the friendly skies (ever less friendly, it seems) for the start of my travel season. Thanks, as always, for reading and contributing.